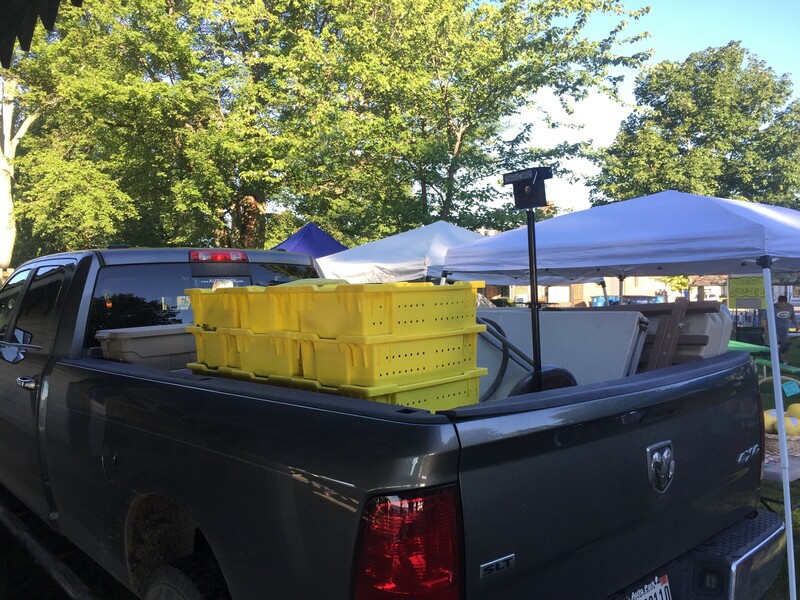 Getting ready to set up at the farmers’ market – over 1800 lbs of produce! So I’ve received a few comments about missing menus. Why haven’t I posted any? Am I giving up my all-organic, all-unprocessed diet ambitions? Or did all of the health stuff I talk about on the why page suddenly reverse itself? Alas, I’m still fighting the autoimmune problem (though it has improved a great deal). It’s more like the weekly menu has taken a summer vacation. The end of the school year is crazy busy for most teachers. For band directors at private boarding schools with many complex ceremonial needs, it’s insane. Add to that running an organic farm, and, well, planned eating is a bit challenging. Eating is a bit challenging… Thus, I intentionally didn’t plan the last couple weeks of classes and all-day faculty meetings. Immediately following that, I was way behind on the farm, due to health problems in the winter and the school schedule, but our annual Hole in the Woodstock event was just a couple of weeks away. So, crazy days there. From there on out, the garden has been dominating life. Two days a week of farmers’ markets (a market may only appear to be a few hours from the outside, but it’s way more than a full days’ work! ), a full day of harvesting for both… Those are times it’s difficult to do a meal. Ironically, they’re also times full of great food! Every morning begins with a walk down each garden bed checking on the progress of our 2 1/2 acres of veggies. There’s a lot of sampling that goes on during those walks! And, of course, I spent a fair bit of time developing recipes for the onslaught of zucchini! So, all told, I don’t really need to plan menus in the summer. Much of my eating isn’t even in meals anyway. However, school’s starting to come back to life. We’ve had a few meetings and workshops already, and the band is back this weekend. Then we jump in, with the matriculation ceremony during the eclipse! So, I’ll be posting menus again shortly. The next couple of weeks are going to be weird transition stuff, so I may not do so until classes get going. But stay tuned, and we’ll be back at it soon!